A digital signature certificate (DSC) is a mathematical technique used to validate the authenticity and integrity of a message, software or digital document.Basically digital signature authenticate the person. It may be issued for 1 or 2 yrs. As your requirement these signature issued. In our situation, we need to fill ITR , so that we need Class 2 Digital Signature. My business page is up! Take a look. Goods and Service Tax (GST) is the tax levied by the central government and state government together to subsume most of the taxes like Excise Duty, VAT, Service tax, entry tax and even the customs duty. Hence, it is very important to understand the registration procedure under GST because even the existing dealer will also have to apply for the GST registration online. This is one of the most important questions, as once GST is implemented everybody will be asking this question, whether I am covered under GST or not ? The very basic answer to this question is if you are supplying goods and services not more than 20 Lakh, then you don’t need to register under GST. In other words, if you supply goods or services for more than 20 Lakh, then you liable to register under GST. Do you need Billing Software ? 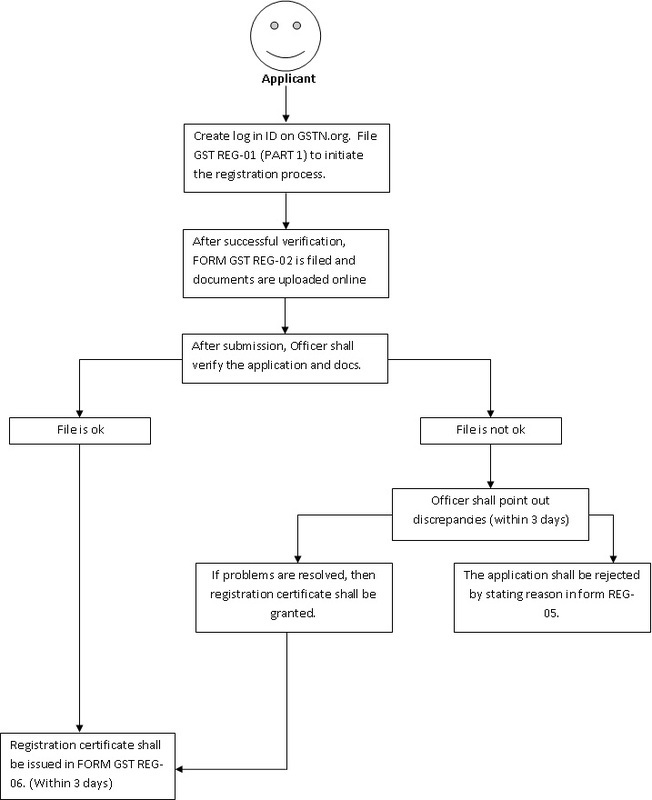 Before going on with detailed discussion, let us first understand the registration process diagrammatically. Here is details presentation of the entire flow. #Step 1- Verify prelim Details: This step deals with creating a login account on the GST website to initiate the registration process. A person has to submit the email, mobile number and PAN on the GSTN portal. The PAN shall be verified automatically online. The mobile number and email shall be verified through a One Time password validation system. These details are to be filed in form PART 1 of GST REG-01. #Step 3- Verification by GST officer: Once the application is filled and submitted, then it shall be forwarded to the proper officer who will then examine the application and the documents attached. If everything is found to be in order, then GST registration will be granted within 3 working days. #Step 4 – No action within 3 working days: If the officer does not respond to you either with deficiencies or approval then the application for grant of registration shall be deemed to have been approved. #Step 5 – Registration Certificate: When the application is approved by the officer, then a certificate of registration in FORM GST REG-06 shall be issued through a common portal. The applicant can easily download the registration certificate from the common portal using their log in id passwords. #Step 6 – Separate registration for each branch: If you have different branches in different states, then separate registration needs to be applied for each state. A registered taxable person eligible to obtain a separate registration for business verticals may file separate application in FORM GST REG-1 in respect of each such vertical. GST registration will be more complexed in the beginning, hence to avoid mistake it is recommended to fill it carefully. If you have any query, kindly submit it to our CONTACT FORM. Interactive voice response (IVR) is a technology that allows a computer to interact with humans through the use of voice and DTMF tones input via keypad. In telecommunications, IVR allows customers to interact with a company’s host system via a telephone keypad or by speech recognition, after which they can service their own inquiries by following the IVR dialogue. IVR systems can respond with prerecorded or dynamically generated audio to further direct users on how to proceed. IVR applications can be used to control almost any function where the interface can be broken down into a series of simple interactions. IVR systems deployed in the network are sized to handle large call volumes..
IVR can be implemented on either Toll Free Number or Virtual 10-Digit Mobile Numbers like 9919069506. IVR systems can be used for mobile purchases, banking payments and services, retail orders, utilities, travel information and weather conditions. The use of IVR and voice automation allows callers' queries to be resolved without the need for queueing and incurring the cost of a live agent. If callers do not find the information they need or require further assistance, the calls are often transferred to an agent. This produces an efficient system, which allows agents have more time to deal with complex interactions. When an IVR system answers multiple phone numbers, the use of DNIS ensures that the correct application and language is executed. A single large IVR system can handle calls for thousands of applications, each with its own phone numbers and script. IVRs will also log call detail information into its own database for auditing, performance report, and future IVR system enhancements. What is Toll Free Number ? How does it works? A toll-free, Freecall, Freephone, 800, 0800 or 1-800 number is identified by a dialing prefix similar to a geographic area code, such as 800. The specific service access numbers vary by country. Goods and Services Tax (GST) is a proposed system of indirect taxation in India merging most of the existing taxes into single system of taxation. GST will be a game changing reform for the Indian economy by creating a common Indian market and reducing the cascading effect of tax on the cost of goods and services. It will impact the tax structure, tax incidence, tax computation, tax payment, compliance, credit utilization and reporting, leading to a complete overhaul of the current indirect tax system. The taxes which will be subsumed into GST include central excise duty, services tax, additional customs duty, surcharges and state-level value added tax.Other levies which are currently applicable on inter-state transportation of goods are also likely to be done away with in GST regime.